Note: Use this image to help you “hop” around. The advent calendar has a link to each day of the month HOWEVER, just like a real advent calendar, the posts do not “unlock” until 9 pm EST the night before the calendar date. I am so incredibly excited to be a part of a fabulous group of math bloggers! 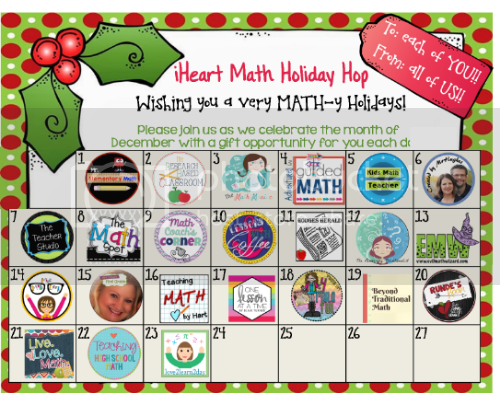 By now, I hope you’ve enjoyed our “iHeart Math Holiday Hop” for thirteen days! If not, after reading my post, head back to the top and click on each blogger’s logo BEFORE me and grab their math freebie and awesome tips! I’ve checked in each day and there have been some AMAZING activities shared! Our school has an amazing staff who continually contributes to the “angel fund” through out the school year. We use the money to help many families when we can. Sometimes we help turn electricity back on, we’ve helped with funeral costs, and we help supply food and gifts around the holidays. On the last day before break every year our cafeteria is transformed into a HUGE warehouse of food. Most of the staff sticks around to help pack. We fill over 100 boxes with various foods that are easy to prepare, fruits, veggies, and a pre-cooked ham. On Saturday morning, we have some families come pick up the boxes and for those that can’t arrange transportation, we buddy up and head out in our sleighs..er, cars! We also supply each child that receives the holiday food with a school sweatshirt, a game or toy and a certificate that lets them know that a yearbook has been purchased for them. I always look so forward to the last Friday before break. It’s such a great feeling to help shop and keep food in the homes of our students over the long break. If you school doesn’t have a fund for your less fortunate students, you should talk to your principal. The money adds up quite quickly when everyone donates $2 or $3 every few weeks! Each year as winter break lingers closer, the energy in my math classroom grows stronger and stronger. In past years I’ve had my students decorate ornaments to take home, but last year I decided to have students make their own ornaments! We had an absolute blast! To read all about this messy adventure, check out my #MIRL post from December 2013. If you aren’t able to, or just aren’t ready to make such a huge mess in your classroom, how about a holiday relay?! Relays are a great way engage your students when the energy is just TOO much to handle!! If you’ve never used my relays before, check out this post on how to use the relays and what they are. Now for a few special gifts for you!!! I have been in SUCH a gingerbread mood that today my friend Marie and I made gingerbread cookies!! We’re still waiting for them to cool off but aren’t they adorable!! Yes… yes, I had to make a pi gingerbread too! 🙂 I was so in love with the cookies, that I took a quick break and whipped up a quick EXCLUSIVE relay template just for each of you!!! Click on the relay preview about to download your own template!! Remember the template is for personal classroom use only. The best part about the relay is it works for ALL grade levels and contents! If you are looking for other great math freebies, you may want to check out the Winter E-books! There are tons of great ideas and FREEBIES in there! The first picture links directly to the Grade 6-12 Holiday E-book. Within that item description are links to the other 4 books. The second picture links directly to my Linear Algebra Gift Tag activity! And finally, I want to share with you another holiday E-book, but with a different twist! In this boo, a bunch of secondary teachers came together to create a book of our favorite holiday recipes! The first picture links directly to the Holiday E-book. The second picture links directly to a FREE activity that featured my holiday recipe! The next ‘stop’ in our holiday hope is with Barbara Balius tomorrow! Make sure to check our her post and grab the tips and freebies! Wishing each of you a happy, healthy, restful holiday! Your Angel fund sounds amazing! I would love to have something this organized at my school. It is so amazing! Makes me so proud to be part of such a loving and generous organization! !